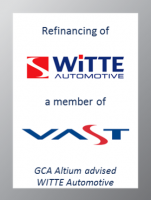 GCA Altium acted as exclusive debt advisor to WITTE Automotive, a globally operating automotive supplier, on the refinancing of its debt structure. WITTE Automotive, headquartered in Velbert, Germany, is among the technological leaders in the field of mechatronic locking systems supplying all well-known vehicle brands such as BMW, Daimler, Ford, Volvo and Volkswagen with latches, hinges, lock sets and door handles. With a revenue of EUR 595 million in 2016, the company ranks among the top 500 family businesses in Germany and employs 4,600 people in five European countries. In order to support the future expansion of the group, WITTE and its shareholders retained GCA Altium to lead a process to refinance the entire senior and mezzanine debt structure. The new financing reflects the current borrower-friendly market environment in terms of funding cost, financial covenants and other borrower undertakings. The syndicated financing will also allow WITTE to introduce a centralised group treasury management that is independent from the constraints of local bilateral funding arrangements which were previously in place. The new consortium, which consists of a combination of incumbent lenders and new banks to the group, provided a EUR 125 million financing package in a club deal.